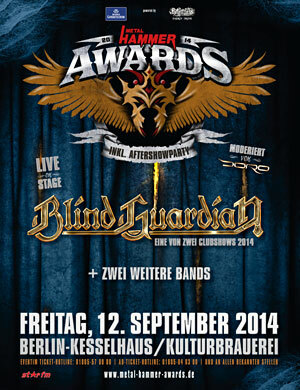 Blind Guardian will be headlining the 2014 Metal Hammer Awards in Berlin, Germany on September 12, 2014. The show will be hosted by Doro Pesch and Martin Kesici and will feature two more, yet to be announced, live acts in addition to Blind Guardian. All the details about the show can be found at www.metal-hammer.de/awards/. At the above link you can also help choose the songs Blind Guardian will play that night. The band themselves have chosen 15 songs from which the fans can vote for 7. The seven most popular choices will be played that night (in addition to other songs). So, if you have ever wanted to tell Blind Guardian which songs to play live now is your chance! To go directly to the voting page just click HERE. Voting closes on August 6th and the results will be posted soon after.